Yesterday I mentioned I had two layouts I wanted to redo. This is the 2nd one. You can find the first version of this layout here. I think using black and white photos was the better choice, however in these photos they look a little brighter than they really are. I didn't really add much embellishments to this layout. The paper did the work for me. This is the first time I tried to incorporate stamping into my journaling. It was fun. It was a little time consuming at first. I found that using text boxes for the spaces I planned to stamp in helped make it a little easier. AWESOME layout. 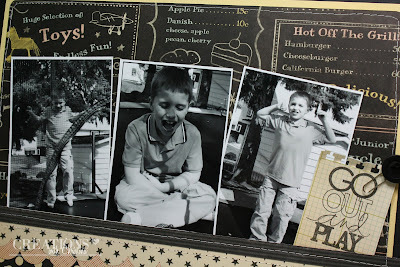 My baby is a Senior so I really need to stop making cards & get on his scrapbooks ~ but, I would rather make cards! 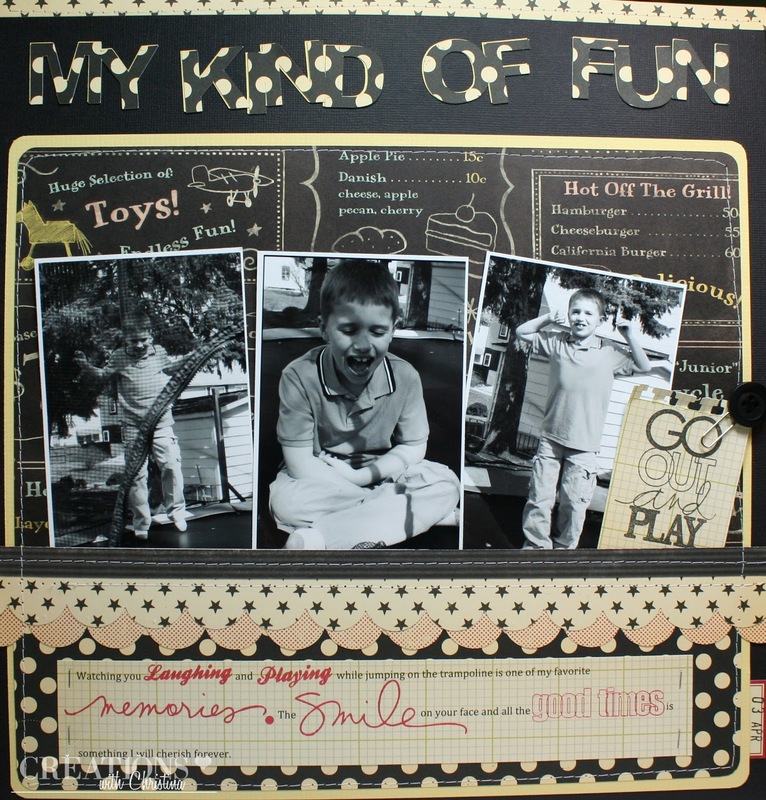 Thanks for sharing a great boy layout! Hi Christina, I always love to see your creation and this one is no exception. 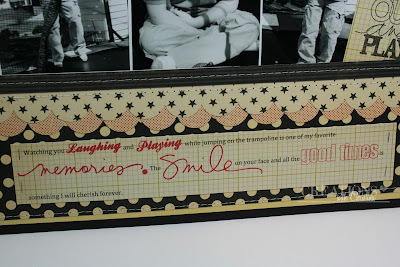 If I may, can you make a video tutorial about how to incorporate stamping into journaling. I have a hard time on leaving enough spacing for the stamp and even, to type within the journal box. Great layout. 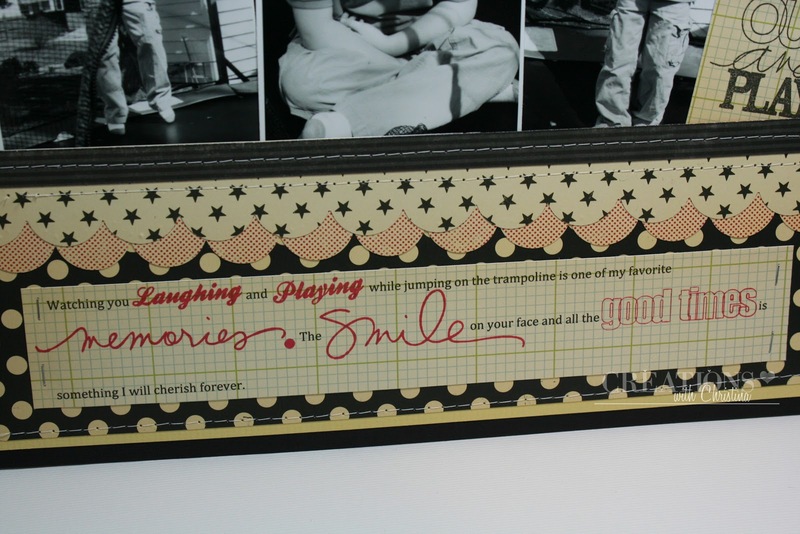 I really like how the journaling turned out. Thanks for posting it. I love this B&W one! Great job as usual. I use my Life's a Party cart I won from you all the time. I think of you every time I use it. Your mom must be a fun creative lady too. Tell her thank you for passing on that special gene to you! Love the layouts, but girl, you are putting us to shame. Most of us can't even catch up on our scrapping and you are going back and "redoing" it!! I'm at least proud to say I got 600 pics printed last weekend and put them in a photo album at least...Love your blog! I have to say that I actually liked both layouts.. Both were nice. I remembered the first one. You actually did something I NEVER do... go back and redo! Once I learn a new technique I put it to use in future layouts and cards. I always figure what I did at the moment was good enough. LOL! 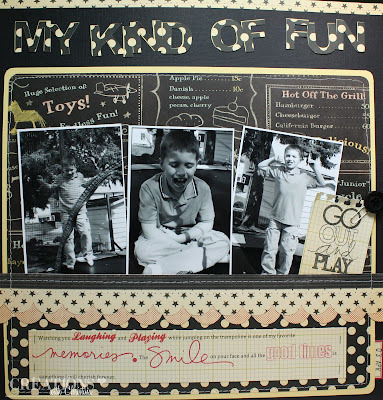 Definitely see the Terri influence in this layout and she is amazing. Thanks for sharing as always! Its amazing how colour vs B&W makes the same pic so different! Any chance you might do a video on how to use the text box to leave a spot for the stamping? Just MHO but I think a red shadow for your title would make this layout REALLY POP!!! It would tie in the red from below and show off that fabulous dotted paper you used for the title.